A teaser of my new terrain. 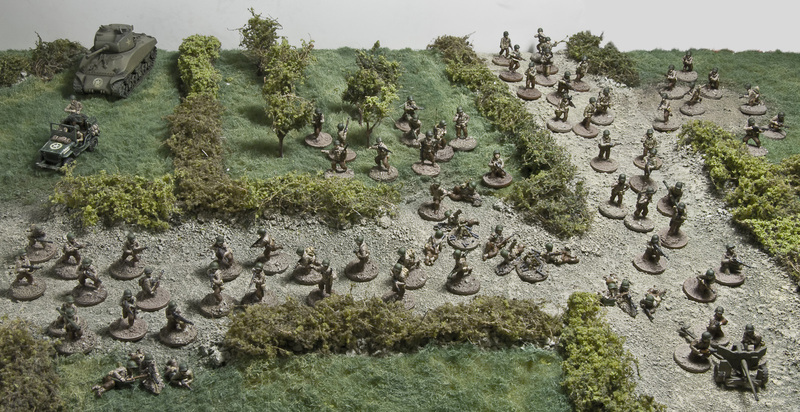 This is showing the first bocage pieces. I ran out of glue and was not able to make more than this few pieces. The boring plain green boards will hopefully be covered up by all kind of terrain pieces. It feels like I am keeping myself from gaming, always abandon my projects to start new up, paint all my figures all over or trash my old terrain and make some new. Now it is the third time I make new terrain, and almost none of the old can be re-used. But this time I felt it was necessary, my old system of making all designed boards was killing me, too slow process to make new boards, too expensive and would soon have taken up all my space. I have made some clean boards with nothing at all on them and will now start to make terrain pieces that I can move around as I want. It will not be as beautiful as my old boards would have been, but now I feel that I will be able to game more instead of always have to make new terrain. 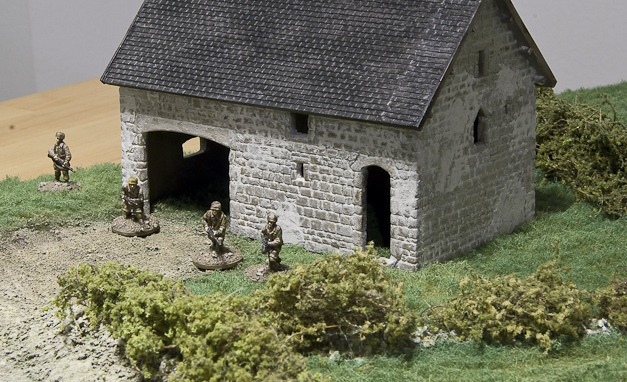 Of course the terrain pieces have to be made, but it doesn’t feel like a hopeless task. 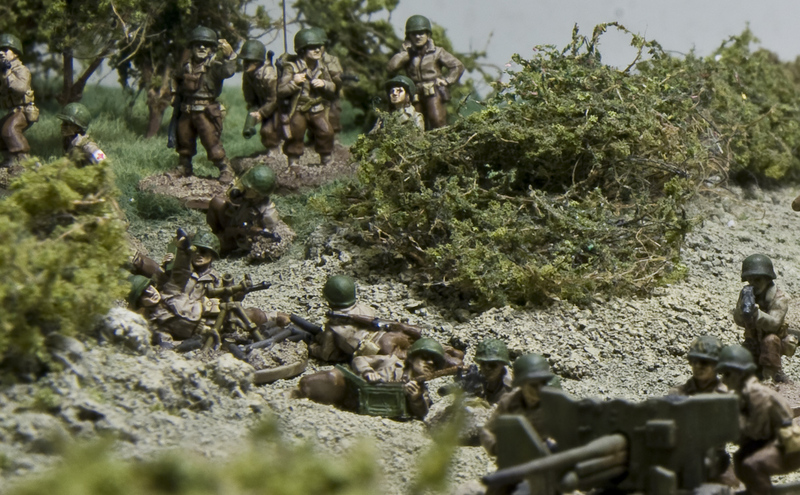 I will soon have 3,4 meters of bocage ready – that needs to be doubled up. 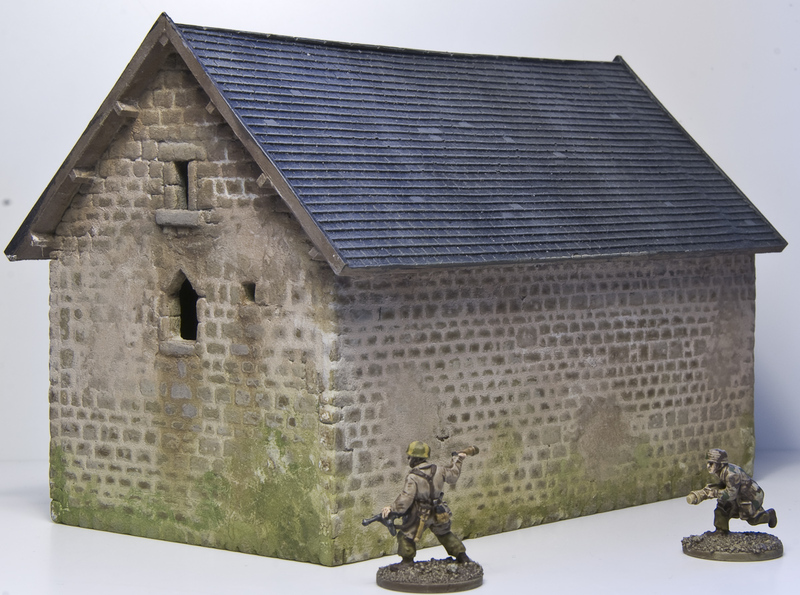 Then I will do dirt-road pieces, cobblestone streets, river pieces, woods, hills, fields, orchards, fences, stone walls, trenches and so on… The good thing is that I don’t need to have everything ready at once, and soon I will be able to play much bigger games than I have before. 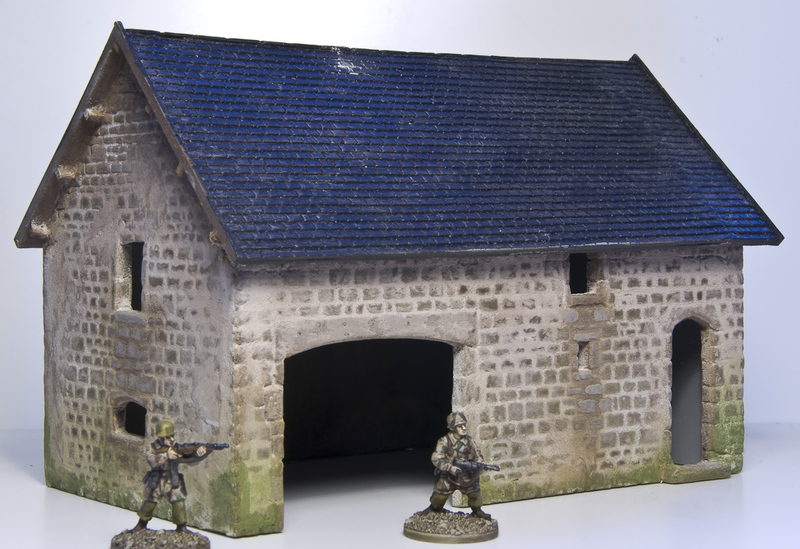 Woooow – it is long time since I have been working on my La Fière Bridge houses. I felt that now is the time to continue. I guess that I have a limit of how many figures I can paint before I have to do something else for a while, I almost did 5 squads. I needed to do something else, so I continued on my house project. Painting a house that I built a year ago. Here are pictures of the painted walls. I still need to add the door, paint the roof, and add details such as moss and strokes of dirt from rainwater. Right now I have used pigments for mortar between the stones but after adding plaster a few places, to make it look like reparations (something the real house don’t have) I found out that I easily will be able to use the plaster as mortar and achieve a more realistic look, so I will probably go back and work on the walls again at some point. In the lower corner to the left I have used plaster as mortar and like the look, I will probably use this on the rest of the house. I like how the house blend into the terrain. The plaster reparations is too distinct though (more on the pictures than in real life). I will probably try to make them less dominant. The house is made for my La Fière Bridge project. 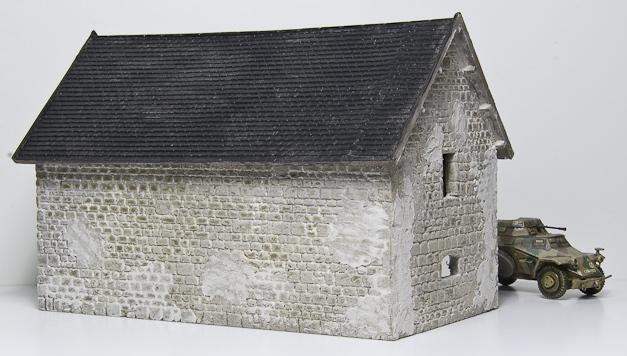 The initial thought was to make moulds of every house that I build for this project so that I easily would be able to make more french farm buildings. The idea was good but I found out that I liked to make the houses from scratch but the process of making moulds was extremely boring. And when considering that I will have 15-20 farm buildings when ready, I probably never are going to need more of them which make all the work doing moulds a bit overkill. 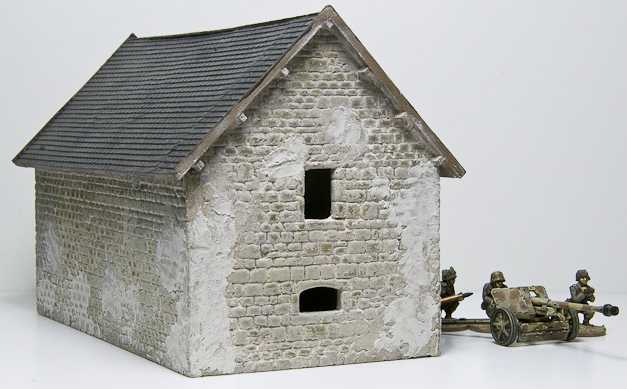 The idea is still good and I will probably do it when I am going to build small town buildings – making moulds for roofs and all the walls minus the facades, then I will be able to do all the fun facade building and just make copies of the rest from the moulds. See the specific house HERE! and all post in the project HERE! I removed as much of the old plaster as possible and added a new layer all over to fill the cracks between the stones. The plaster was a bit too bright so I sprayed a thin layer of brown all over and then added pigments to make it look old – now I am pretty satisfied with the result. Just a quick update. Between painting US Platoons and do all the Christmas preparations I did finish my first test FJ squad. I will now go full force on doing the rest of the platoon. 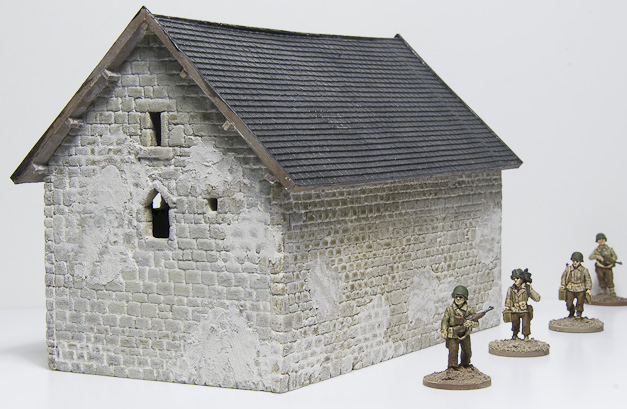 Next to become battle ready is the Platoon Head Quarter. I cannot paint much bigger numbers at a time, it becomes to boring and I need to see some progress, but I will also start to miss small details if I paint to many at the same time. All pictures can be shown in bigger size by clicking them! 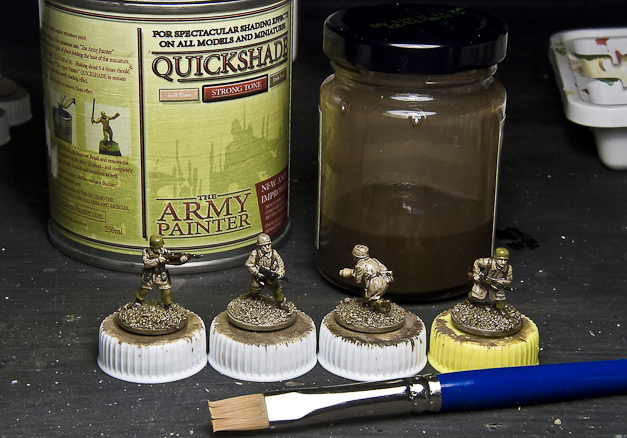 This is a quick guide on how I paint my 20mm wwii figures using Army Painter Quickshade. 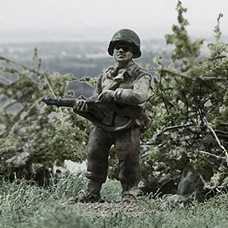 I will demonstrate on some Fallschirmjägers that I am painting for my Normandy Project, but it could be almost anything other than this, the limitations comes when you want to add colors that are very bright because the Army Painter is brown and will make the figures look a bit dull and dirty (which is great for modern war themes). 1. Before painting I of course made some research on camo and colors, in this case I actually used quite some time trying to find the right uniforms for the era. In the end what I found out can be summed up in this picture from a Dragon 1:35 figure box. I used the color scheme from example 2 and 3, in the other zug’s I will probably also use the two other examples to make the overall look more rag tag style. 2. The figures are glued on to some coins using Super Glue Gel. Then I add a mixture of sand (from the beach) and fine gravel (from a road mending), this is glued to the bases using a thin acrylic glue. 3. 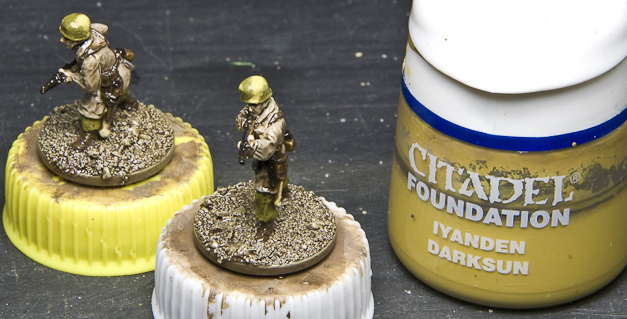 With a big brush (size 10) I paint the base with a special base color from Games Workshop. Normally I’m not a big fan of GW’s paints, but I really like this base colors – they have lots of pigments and shrink when it dries which helps keeping the details on the small figures. This is an older version of the paint, GW have altered the colors and renamed them, but you will probably be able to find something similar. 4. I then drybrush the base with Vallejo color number 120. 5. Now it is time to give the figures their base color. 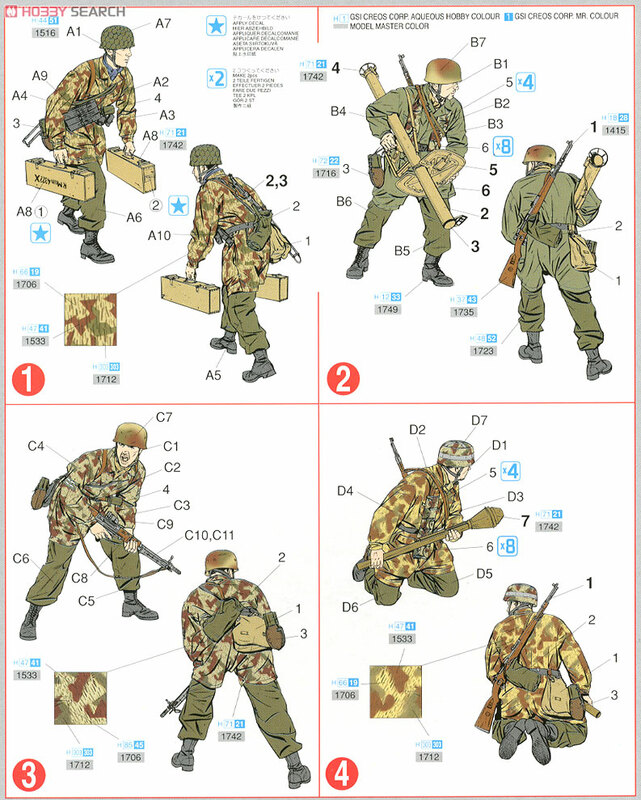 This is the color the Fallschirmjägers camo jackets and helmet covers will have. I use GW’s Base Color: Rakarth Flesh. Until now I have been using the same big brush for all steps. 6. I will now paint all the details on the figures. It is necessary to pick colors slighty brighter than intended because the Army Painter varnish will darken them a bit. I try to add the colors in the best order possible because on this small sized figures I can’t paint perfect, by picking the right order, hopefully my accidents will happen on a detail that haven’t been painted yet. But still I will always have to make some small corrections before moving on to next step. I use brush size 1 for all this colors. Vallejo Medium Sea Grey 158 for haversack bags. Vallejo Grey Green 165 for the dark canvas ammo belt. Vallejo German Cam Orange Ochre 128 for brown details such as the wood on the rifles and canteens (the one on seen in the picture i found out was too dark to use). Vallejo Leather Brown 147 I use for all leather details. Vallejo Yellow Green 112 for trousers and the helmets that don’t have helmet covers. Vallejo Basic Skincolor 017 for skin. Vallejo Amarillo Caqui 120 for the panzerfaust. 7. Almost all colors are added, flat and with no shadows or highlights. The Metal paint and the colors in the camo will be painted on after the Army Painter has been added. 8. I use the “Strong Tone” version of the Army Painter. The can that comes with the varnish isn’t very good, if the lid isn’t perfect sealed it will dry out. I therefore have some of it in a glass jar which is easier to keep sealed, while the can is put into a freezer bag and tucked away. 9. 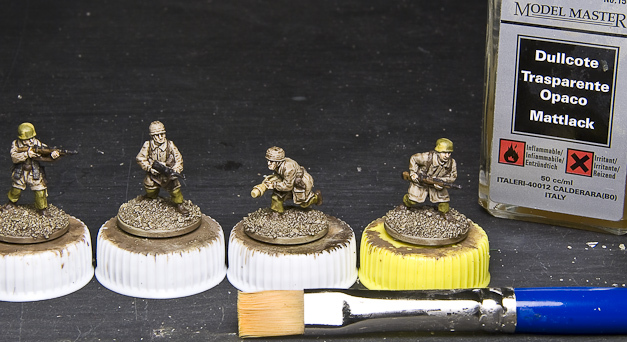 Using the big brush again I add the varnish to the figures, including the bases. It is necessary to move it around a bit with the brush to make sure that it looks okay. It is important not to use too much of the varnish, it is quite thick and if it lies on top of folds and other highlighted areas it will look wrong, but it will by it self seek down in folds and holes, it just need a little help some places. Now it just have to dry. This can take several hours, I use to add the varnish before I go to bed and the day after I will be able to paint the rest. 10. The figures have been left to dry overnight. Now it is time for camo. I prefer doing this after the varnish is added, else the camo colors tend to mix too much with each other and doesn’t look as good. I start with the bare helmets that don’t have covers. 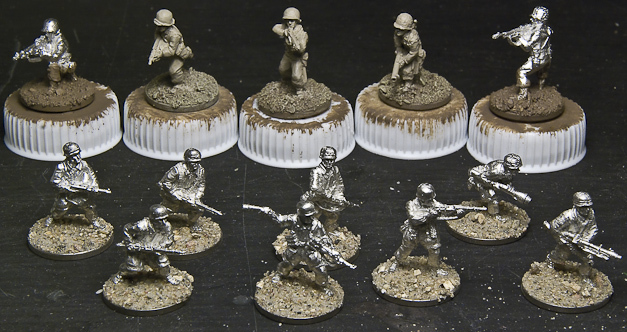 The Fallschirmjägers did spraypaint their helmets with dunkelgelb (dark yellow) color – I am not going to spraypaint color on such small figures so I’ll use the brush. The acrylics don’t have to be a GW base color, it was what I had. I make the color thinner with water and add it in steps, letting it dry before adding more, I work my way inwards to give the color a gradient look. 11. Before I paint rest of the camo I will give the figures a Dull Coat, I think that Model Masters is by far the best one (my bottle has almost dried out though, which make it hard to work with and I don’t think it is as matt as it used to be, have to buy a new one). 12. The camo is added with a thin brush, using Leather Brown 147 and Reflective Green 090. The splinter pattern camo is by far the hardest one to get to look right if asking me. I have to upscale it a bit, otherwise it will be too hard to recognize, and hard to paint too with all those small details. I have seen some adding the thin strokes that is typical for the camo, but this is way to overkill for me, even the thinnest strokes your are able to paint with your brush will be far to big – it just looks all wrong. After this I add Metal color to the weapons, paint the bigger stones on the base greyish. Then the last thing to do is to give it all a thin layer of dull coat again. 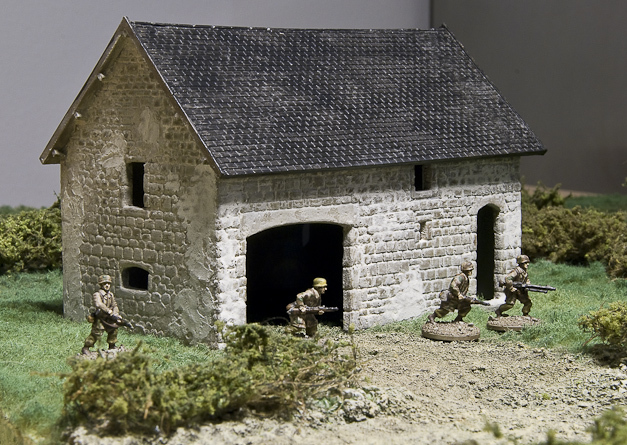 Soon finished with my latest task of painting a US platoon to be used in my Normandie games, I will go on and make some Fallschirmjägers from FJR 6 for the same campaign. I will start out with a squad to try find the right colors, then a whole platoon or hopefully two will follow. 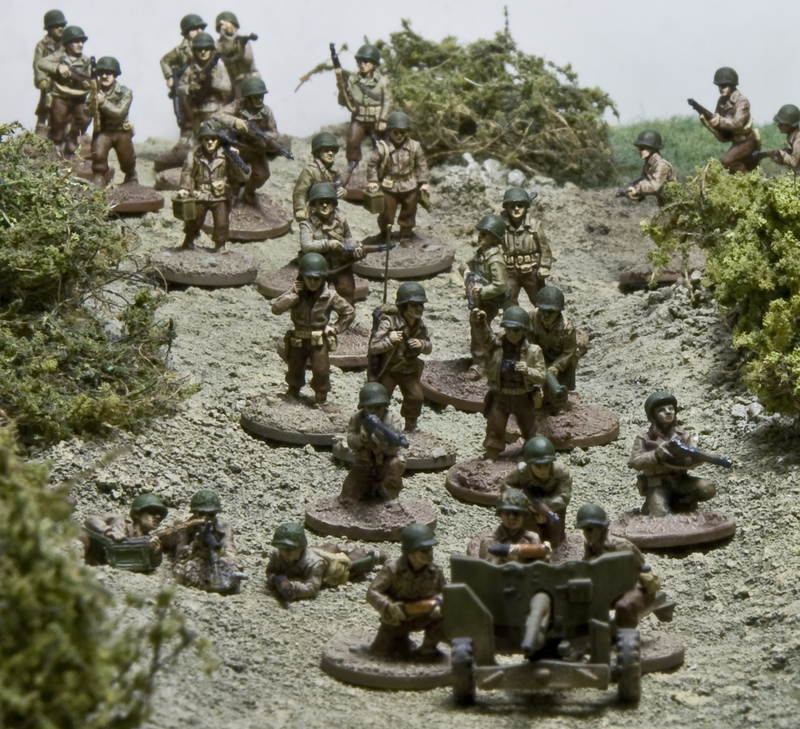 The US soldiers in the top are amongst the last one’s that has to be painted for fullfilling the US platoon. Just finished this two Squads (+ a medic), the left squad is the Command squad. 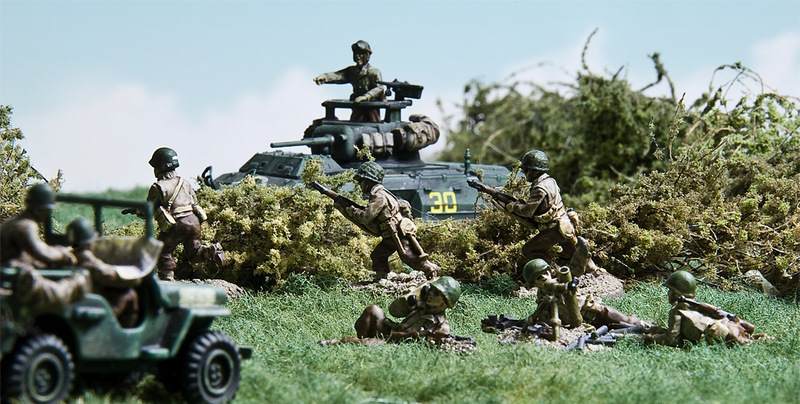 Quite soon the last squad will be finished and when I have painted their support weapons (2 Machine Gun teams and a Light Mortar team) I have 2 US platoons and one to go before the Company is ready. 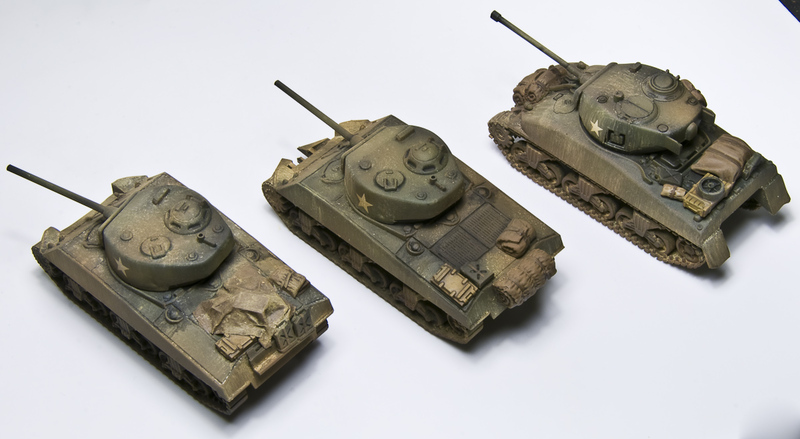 I organize my troops so that they fit the Armoured Divisions armylist from Battlegroup: Overlord. I didn’t feel that my newly bought Armypainter Quickshade was as good as the old one, but after using it a couple of times it feels right again. One thing I don’t like with it though, is that it is much more glossy than the old one. I always gives my figures a dull coat, but still it is quite irritating, thinking that it will be visible when the coat starts to be worn down. What I have to paint before the company is done (a few figures need to be bought though). Already painted: The first platoon… Not very much considering that I have been doing this for some years… But at some point last year I washed all the painted stuff down, both US and Germans, and started to repaint all my figures. Nothing special with this figs… what is special is that this four figures (I made a soldier with a BAR too) are the first one’s that I have painted in more than a year. On the mortar base I added some grenade tubes to make the base a bit more intresting – made them out of some Evergreen Styrene Rod. 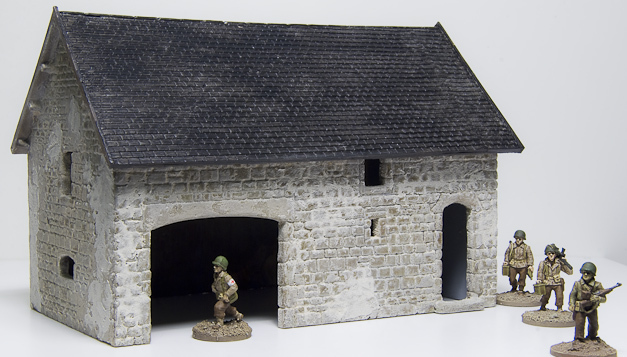 My old Army Painter Quickshade had finally dried in, so I had to jump on my bike and head for the Hobby store. The new varnsish was not as dark as the old one, I had to fiddle with it for a while before I was happy. And of course, I had to put them into action. Click the picture to see it bigger for more details.